Summary: A satisfactory set of results from this specialist drill manufacturer. Sadly the bumper Q3 reported in November was followed by a more subdued Q4, so I’ve had to trim my valuation estimates a little. Nonetheless, the shares do not appear outlandishly valued and I’m hopeful the stronger second-half bodes well for 2016. The books are still cash rich and management has started to improve cash flow, although the dividend remains at a standstill. I continue to hold. Click here for my previous MCON posts. * Satisfactory results, with additional accounting notes, too! Total revenue improved 29%, with MCON’s own drills and bits enjoying an underlying €3.3m (or 8%) revenue improvement for the full year. That rate of advance seemed very respectable to me, given 60% or so of the top line is currently sold to the battered mining industry. Also helping revenue were additional sales of third-party products, several small acquisitions and favourable currency movements. However, 2015 operating profit did drop 3% to €10m due mainly to additional costs associated with the recent acquisitions. Four new subsidiaries purchased during 2015 contributed a €0.1m loss for the year (read more on these acquisitions in the Comment section below). It’s worth recalling that August’s interim results had cited one-off costs of €380k, and this full-year statement additionally referred to “termination payments” of €166k. So perhaps MCON’s ‘underlying’ profit for the year may have been €0.5m or so higher than what was reported. Operating margin for the full year was 14%, which I admit is someway off the levels achieved a few years ago. Nonetheless, that 14% margin does not look too bad in a report that (once again) cited “pricing pressure”, “difficult environment” and “challenges faced by certain markets”. I still like to think that MCON’s manufactured drills and bits are of high quality, and that customers remain happy paying a premium for the extra product efficiency and durability. Perhaps I should not read too much into MCON’s progress every three months — clearly the bumper Q3 has helped counterbalance the weaker Q4. Anyway, the lower gross profit recorded during the final three months of the year suggests that Q4 was dominated by sales of third-party products. That theory is supported by the cost of low-margin third-party products purchased during H2 being 41% higher than that purchased during H1 (€8.1m vs €5.7m). I’m pleased MCON has improved its cash flow. I mentioned in August how the group’s H1 witnessed €5.3m being diverted into working capital — a substantial amount when the reported operating profit was €4.5m. MCON’s stock-turn therefore comes to nine months! Sadly the improved cash flow was not enough to lift the dividend. 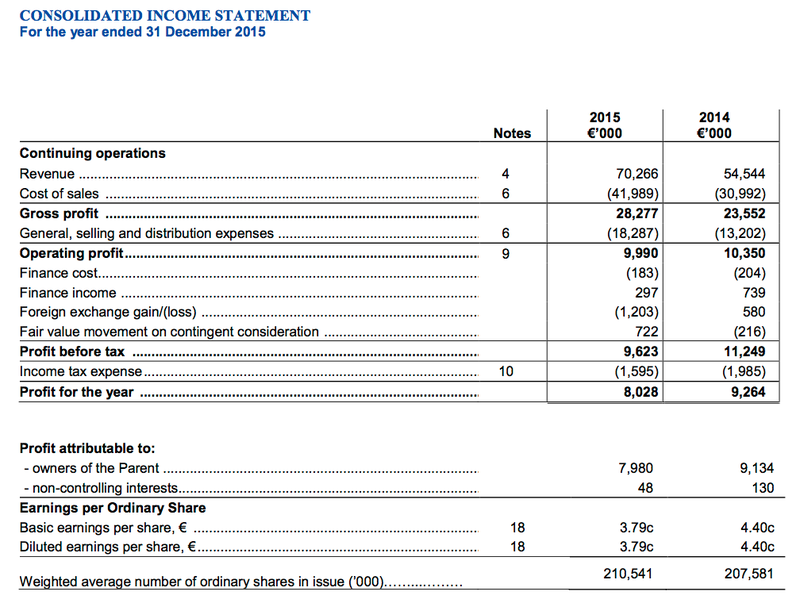 As I suspected from reading the 2014 annual report, the full-year payout was held at €0.02 per share. My previous valuation sums had assumed Q4 could replicate Q3, which was a tad optimistic in hindsight. So taking 2015 as a whole, and adding back €0.5m of ‘one-off’ costs, then I am looking at an £8.1m operating profit after conversion at £1:€1.30. Taxed at the 17% seen during last year, I then arrive at earnings of €6.7m or roughly 3.2p per share. Adjusting the present £116m market cap for the €38.6m net cash position as well as deferred acquisition payments of €6.4m, my estimate of MCON’s enterprise value comes to £90m or 43p per share. Then dividing that 43p by my 3.2p EPS guess gives a multiple of 13-14 at the present 55p offer price. Alternatively, doubling up the stronger H2 would give me earnings of 3.3p per share and a cash-adjusted P/E of close to 13. 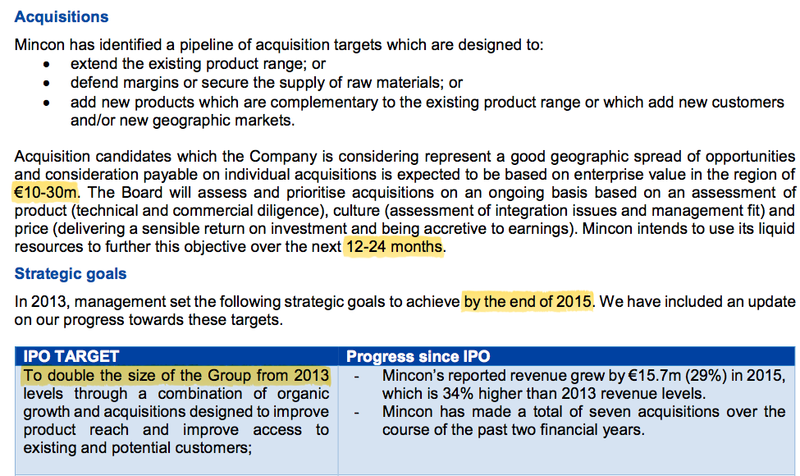 Disclosure: Maynard owns shares in Mincon. Something that I have spent some time looking at is the smallprint concerning MCON’s acquisitions. At first it appeared the numbers did not add up. But on reading the smallprint closely, I think I know what has happened. When I first looked, the accounting smallprint suggested MCON’s acquisitions did not perform as well in H2 as they did in H1. It read to me as if the acquisitions contributed revenue of €3.8m during H1… but only €1.9m (€5.7 less €3.8m) during H2. And yet, all the associated acquisitions were completed during H1! As such, I would have thought H2 would have produced more acquired revenue, not less. Also adding to the confusion was an apparent reporting discrepancy. The H1 small-sprint suggested revenue of €2.4m (€6.2m less €3.8m) was produced by the new subsidiaries during H1 before their purchase. But the full-year statement reckoned the figure was €1.4m (€7.1m less €5.7m). On further studying I noted the H1 smallprint refers to ‘revenue’, while the FY smallprint refers to ‘net additional revenue’. I am pretty sure the difference is that the latter excludes ‘inter-company’ revenue and just covers that sold to external customers. The figures did look odd at first but I now reckon nothing too untoward has happened with the acquisitions in H2. MCON has simply changed the acquisition revenue figure from gross to net. I though it useful to check how MCON was progressing with the strategic goals it set out at the time of its flotation (late 2013). Following the 2015 results covered in the Blog post above, we now know the business has not doubled in size. Between 2013 and 2015, revenue in fact advanced from €50.3m to €70.3m while operating profit actually declined from €15.0m to €10.0m. The firm has been looking for individual deals in the €10m-€30m range, but none has been forthcoming during the last two years. Instead, the firm has purchased seven smaller subsidiaries since August 2014 for a total of €10.3m, with a further €6.3m to be possibly paid in future depending on whether certain earn-out targets are met. I look forward to reading the 2015 annual report and an update on these strategic goals. I have a holding in these – not big enough to warrant expensive action. I am impressed that there has been no director sales, I suppose. I am irritated by the euro divvy and the irish taxes. I liked the results but, of course, they haven’t moved the price because the shares are so rarely traded. One day I suppose they will be more liquid – perhaps when the sector turns around and the directors ‘satisfy institutional demand’. Meanwhile, thanks for your excellent analysis – at least two PIs are interested in the company. Thanks for the comment. The directors (including the now ex-chief exec) never sold a share at the float and have still not sold any shares. Options are few and far between, too, and given only to non-board staff. So there is a decent alignment here between bosses and us outsiders. This sort of situation attracts me. Plus of course there is what seems to be a decent competitive position, which is currently being clouded by the mining downturn. At some point I hope, profits will recover and more investors could then become interested in the share. If you look at FW Thorpe for instance, for years that share sold on a single-digit P/E as it was small and family run, but eventually profits grew to the point where investors could not ignore its progress and the market cap was re-rated quite significantly. It is just a case of being patient and trusting MCON’s managers can advance the company over time, and I am sure something similar could happen here. Just on World Career Network – I was interested in picking up a few shares in this, but my broker (IG Index) will not allow me to set a price, only taking the current market price. Is this an issue you encounter with certain shares? How do you get around it? Thanks for the comment. I use a different broker, so I am not sure exactly how IG operates. I generally try to buy immediately ‘at best’, so I know what I am paying. I just wait for the quoted price to fall to about what I am prepared to pay and sometimes I am given a buy price inside the quoted spread. Only when there is no stock available do I set a limit price, but these have been ignored by my broker in the past — even when the quoted price suggests a deal could go through. I am not sure if my ignored trades are to do with my broker or the market makers or what really. With World Careers, I spotted there was a seller a few months ago and I simply bought what s/he was selling. With this sort of illiquid share, you just have to accept the market price from your broker — unless there is a seller of this share in the market, in which case the quoted price should drop and in reality you may be able to buy even below that. Thanks for the response! Looks like patience is the name of the game with the illiquid stuff. Luckily my broker allows me to set SMS alerts, so I will try that. MCON is somewhat unusual with its reporting as the management narrative supplied within the preceding annual results RNS is not always repeated in the subsequent annual report. In particular, the ‘Business Outlook’ section of the 2015 results RNS is not included in the 2015 annual report. Furthermore, there are sections of text included in the report that are not included in the RNS. This approach to reporting does not make life that easy for shareholders. Instead we can work out Down The Hole (DTH) product revenue was €36,538k (up 13.5% in total) and RC, Rotary and Horizontal Directional Drilling (HDD) combined was €14,053k (up 43.1% in total). Going on my notes from last year and MCON’s comments this year, I think for 2015 Rotary did €6,250k revenue, HDD did €2,750k revenue leaving RC with €5,053k revenue (up 32%). I suspect acquisitions and currency movements played their part with RC’s progress. MCON claims that demand for RC drills, used typically with exploration drilling, is at an “extremely low ebb at present“. I am pleased there is lower capex forecast for the next three years, with such expenditure broadly matching depreciation. As I wrote last year, I am pleased the board had not become fixated about sticking to the end-2015 target and I hope the executives remain disciplined with any transactions. So far the deals have all been relatively small. The group’s dividend comment is the same as last year. After the payout was held at €0.02 in 2015, I guess I’ll receive the same for 2016. Similar to last year, I could not see much to worry about here. 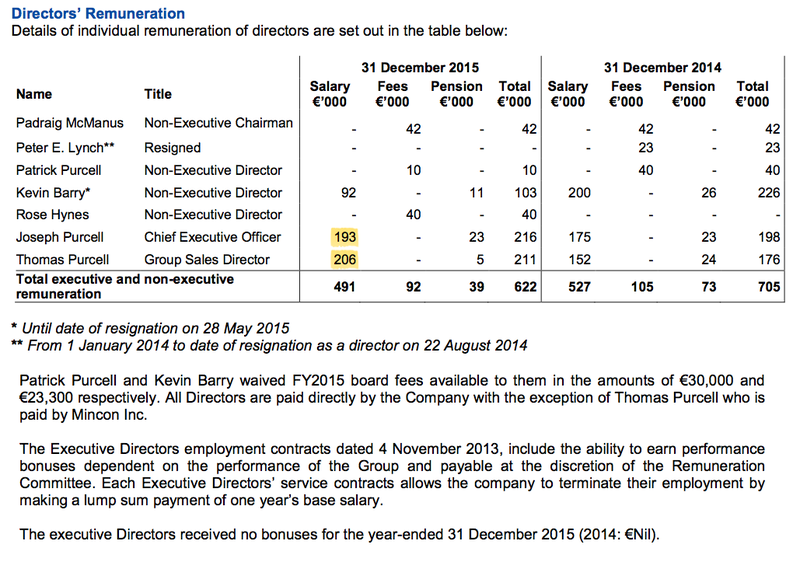 Joseph Purcell’s €193k salary includes about 7 months working at the chief executive, who was paid €200k last year. So I think Mr Purcell is on the same money. €200k is equivalent to £156k and does not look excessive for running a business with profits of almost £8m. The salary for Thomas Purcell appears to have benefitted from being paid in US dollars. I see no bonuses were paid in 2015 (none was paid in 2013 and 2014, too). Nice to see the major shareholders, Patrick Purcell (57%) and Kevin Barry (14%), waive their fees as well. This was a rather so-so statement that contained mixed news. Perhaps the most promising part of the update was the outlook section — there is now management talk of “some improvements in the market“. Revenue in Q1 2016 was 13% ahead of the same period last year, mainly due to the full year impact of acquisitions. Sales of Mincon manufactured product have increased across all geographies in Q1 2016 compared to Q1 2015 due to the expanded geographic footprint of the Group and increased market shares. The first quarter is historically our slowest quarter with winter shut downs in the Northern hemisphere and summer vacations in the Southern hemisphere. Revenue gaining 13% seemed reasonable to me. Using my quarterly stats referred to in the Blog post above, I reckon Q1 2016 revenue was €15,947k. The gross margin for Q1 2016 was 40%, up from 38% in Q1 last year, and profit before tax was 10% compared to 12% for the same period last year, however, excluding the favourable foreign exchange movements in Q1 2015 (which contributed approximately 4% to profit before tax in Q1 2015), the underlying profit before tax margin has improved. The foreign exchange charge in the first quarter of this year was insignificant. I am pleased the gross margin improved to 40% after the 2015 results showed that figure drop to 37% during Q4 of 2015. I wonder if the gross margin can now be held at 40% or more throughout 2016. I was disappointed to see the pre-tax margin drop to 10%, although we are now told the 12% pre-tax margin from Q1 2015 was bolstered somewhat by foreign-currency gains. So I guess there has been some underlying trading improvement during the period. My sums indicate Q1 2016 gross profit was €6,379k and Q1 2016 pre-tax profit was €1,595k. The Mincon Group is conscious of the impact of the currency movements in its markets and is reviewing the group structures with the objective of mitigating the exposures to the extent considered commercially sensible. Our investments in our subsidiaries and their trading is long term, and some of the trading currencies, such as the Rand and the Australian dollar have softened considerably over the years, and can be volatile on occasion. This has generally all been said before, although I do like the reference to investments being “long term“. The balance sheet of the Group remains strong, with net cash as at 31 March 2016 of €35.5 million (31st December, 2015: €38.6 million). The €3.1 million cash outflow in the quarter was split between capital expenditure payments of €1.5 million for equipment ordered last year to maintain and expand our manufacturing capability, and a net €1.6 million used in operations. The quality of our factories and their capabilities continues to improve, and the market reach of the business through direct sales channels is a significant step forward since the time of our IPO in late-2013. There is some seasonality in the sales of our business with Q2 and Q3 traditionally being the busiest quarters, and the running of our factories sees us building some inventory through Q1 as we manage the efficiency of our factories and distribute to our sales companies across the world. Management remain cognisant of the need for a disciplined approach to working capital management and continue to take initiatives to reduce working capital levels while continuing to invest for further growth. 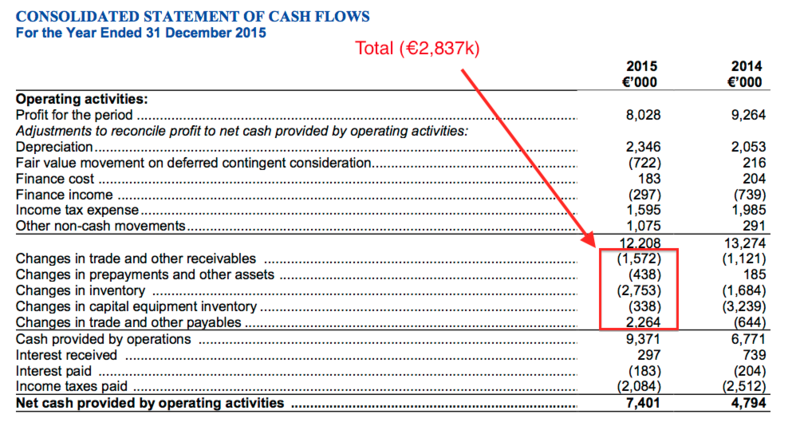 I was disappointed to see the cash pile lose €3.1m during the quarter. We see little demand for capital equipment in the current environment, and may move towards a rental model to utilise the investment placed in this category. Last year’s Q1 statement said the sale of rigs was a “key part” of the group’s Southern African strategy. It looks a sensible move to switch to renting these rigs. Overall, taking account of trading in the first three months of the year, we expect some improvements in the market for our products in 2016. Well, this is the first time I can recall that MCON has suggested “some improvements” may be forthcoming in its market. That is quite promising. On a trailing 12-month basis, and adding back €0.5m of ‘one-off’ costs referred to in the 2015 results, I am looking at an £7.6m pre-tax profit after conversion at £1:€1.31. Taxed at the 17% seen during last year, I then arrive at earnings of €6.4m or roughly 3.0p per share. Adjusting the present £120m market cap for the €35.5m net cash position as well as deferred acquisition payments of €6.4m, my estimate of MCON’s enterprise value comes to £112m or 53p per share. Then dividing that 53p by my 3.0p EPS guess gives a multiple of 18 at the present 65p offer price. The multiple is about 15 based on the 57p bid price.